The land of thunder dragon, Bhutan has equally exotic capital that’s straight out of the fantasy world. It has mythical masked dances performed during iconic Tsechu Festival, a living palace and legendary dzong. But still, the intrigue doesn’t end here. In fact, this is the first city in Bhutan to shrug off the friendly village tag. On the way to commercial independence, the city is a bundle of contradictions. 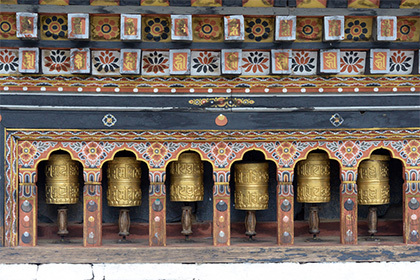 One can experience the richness of culture right away from Thimphu itself. The crimson robed monks, natives dressed in traditionally woven ghos and kiras – also the national dress, weavers, and sculpturers working on their artistic creations are a regular sight in the country. A part of western Bhutan, the city is also the tourism capital of Bhutan. As the first point of attraction in the country, the city offers immense opportunities to soak in the scenic landscapes, immerse in serenity of Buddhism and enrich in Bhutanese culture. In addition to the traditional attraction, the city also has cafes, 5 star hotels, bars, and restaurants that offer a modern side to this captivating city. Some towns in Thimphu also have ATM machines as well. But even after adorning the modern outlook, the beauty of Bhutan lies in how it retains the cultural identity. Trashi Chhoe Dzong – The iconic Buddhist monastery and fortress on the western banks of the Wang Chu River, Trashi Chhoe Dzong is the must visit attraction of Bhutan. It not just commands influence over the city, but also is the center of all religious activities and monarchy of Bhutan. The famous Tsechu festivities take place in the courtyard of this structure. National Memorial Chorten -One of the city’s most visible structures, the National Memorial Chorten is a Tibetan inspired religious shrine used by locals for their daily worship. The natives ambulate around this massive structure, spin large red prayer wheels and pray in the shrine. Remarkable for world’s peace, this sacred structure is an extraordinary example of Buddhist architecture and artwork. Folk Heritage Museum -Bhutan has a rich culture and those visitors who are interested in it can surely visit Folk heritage museum. The highlights here are the interesting glimpse into rural Bhutanese life and their typical household items, tools, equipments, etc. The Centenary Farmer's Market –Famous as the weekend market, this is the largest domestic market for the Bhutanese farmers. Visited by farmers who are interested in selling their fresh and organic produce, this is also a favoured place for tourists who are keen to experience the native’s vocation. Simtokha Dzong -Simtokha is the oldest surviving dzong structure in Bhutan. Modeled after Gyal Gyad Tshel Institute of Ralung (Tibet), the architecture of this dzong is distinctive with the central tower having 12 sides. Besides a historical monument and a former monastery, the location is also one of the premier Dzongkha language learning institutes. March to May and mid September to the end of October are the best months to visit Thimphu. Thimphu Tsechu – One of the biggest Bhutan festival, Thimphu Tsechu is a part of the city’s culture and lifestyle. In fact, thousands of natives wait for the festivities to begin. The center of the festival is Trashi Chhoe Dzong and many natives and tourists block their dates to experience the heightened festivities of the city in the form of masked cham dance and unfurling of a giant Thangka called Thondrol. Thimphu Dromchoe - Besides Tsechu, the destination also celebrates a day of festivities during Dromchoe. The festival again features the spectacular sacred dances dedicated to the chief protective deity of Bhutan, Palden Lhamo.